This analysis is the second part of a multiphase effort to analyze subsidized child care and development programs in California. (Read the first part.) Future phases of this work will examine the unmet need for subsidized child care for children from birth through age five. California’s child care and development system allows parents with low and moderate incomes to find and maintain employment while providing care and education for their children. On average, from 2013 to 2015, more than 1.5 million children were eligible for subsidized programs, but only 13 percent were served in a program that could accommodate families for a full day and throughout the year. While the share of eligible children participating in these programs was low across all racial and ethnic groups, Asian and Latino children had the smallest share of eligible children enrolled in subsidized care. There are a number of reasons why Asian and Latino children could have lower rates of participation, including the rapid population growth of these two groups over the past decade; immigration- and language-related barriers to accessing subsidized care; and difficulties in utilizing subsidized care while working in low-wage jobs. Policymakers should substantially boost funding for the subsidized child care and development system to allow for greater participation for all children, in addition to addressing burdensome eligibility and reporting rules and increasing subsidized child care provider payment rates, which could improve access for many families in California. The share of eligible children enrolled in a subsidized child care and development program was low across all racial and ethnic groups, ranging from 7.8 percent of the eligible population for Asian children to 31.8 percent for black children. Even for black children — the demographic group with the highest share of eligible children enrolled in a full-day, full-year program — roughly 2 out of 3 eligible children did not receive subsidized care. Only about 1 in 13 eligible Asian children were enrolled in a subsidized program — just under 9,000 out of an estimated 112,000 eligible children (7.8 percent, as noted above). An estimated 128,000 black children were eligible for subsidized care, but only 41,000 (31.8 percent, as noted above) were enrolled in a state program. Fewer than 1 in 5 eligible white children received subsidized care (18.2 percent). An estimated 207,000 white children were eligible, but only 38,000 were enrolled in a full-day, full-year program. Population Growth. In part, demographic groups experiencing rapid population growth are less likely to be enrolled in subsidized care because the number of child care and development “slots” has not kept up with this growth. [ix] For example, over the last decade the Asian child population in California (from birth through age 12) increased by 14.3 percent and the Latino child population grew by 7.8 percent. [x] At the same time, funding for subsidized care decreased and the number of slots shrank as state policymakers made dramatic cuts during and after the Great Recession. As noted above, Asians and Latinos have a markedly lower share of eligible children enrolled in subsidized care, as compared to white and black children. Substantially increase funding for subsidized child care and development programs. State policymakers could improve access to subsidized care across racial and ethnic groups in part by ending years of underinvestment. Funding for California’s subsidized child care and development programs was cut by about 40 percent (inflation-adjusted) during and after the Great Recession. While state policymakers have made reinvestments in recent years, far fewer children overall are being served in the current fiscal year than in 2007-08, at the onset of the Great Recession. Significantly boosting funding for subsidized care would help to address the lack of access among every racial and ethnic group. Continue to increase payment rates for subsidized child care providers, including license-exempt providers. Families access child care and preschool programs via licensed child care providers that contract directly with the state or by using vouchers to select the child care provider (licensed or license-exempt) of their choice. During and after the Great Recession, policymakers failed to update the payment rates for these providers, and even cut the payment rate for license-exempt providers. Lack of funding for payment rates means that the providers may not be able to reimburse employees at a level that is commensurate with their experience and education or cover other operational costs. Recent years’ investments in provider payment rates have resulted in modest gains, but policymakers have much further to go. As California’s minimum wage increases to $15 per hour in coming years, many child care workers will receive a much-needed raise. [xix] If reimbursement rates are not increased annually to keep pace with the minimum wage, this will continue to place a strain on providers that offer subsidized care. Moreover, as mentioned previously, policymakers cut license-exempt provider payment rates from 90 percent to 60 percent of the licensed rate for family child care homes. While the 2016-17 budget agreement increased the payment rates to 70 percent of the licensed rate, policymakers should increase the payment rates even further to ensure that license-exempt providers are paid at least the equivalent of the minimum wage. Children are the engine that will drive California forward in years to come. Investing in our state’s child care and development system can increase families’ economic security and, in turn, boost children’s health and well-being. These are some of the first steps necessary to improving school readiness and closing achievement gaps that affect low-income children and children of color. Making greater investments in our state’s subsidized child care and development system, and improving access for eligible children, will not only change children’s lives, but will also maximize California’s future potential. [i] Center on the Developing Child, Harvard University, Five Numbers to Remember About Early Childhood Development (2009) and Christine Moon, Hugo Lagercrantz, and Patricia K. Kuhl, “Language Experience In Utero Affects Vowel Perception After Birth: A Two-County Study,” Acta Paediatrica 102 (2013), pp. 156-160. [ii] Emma García, Inequalities at the Starting Gate: Cognitive and Noncognitive Skills Gaps Between 2010-2011 Kindergarten Classmates (Economic Policy Institute: June 2015) and Nicole L. Hair, et al., “Association of Child Poverty, Brain Development, and Academic Achievement,” JAMA Pediatrics 169 (2015), pp. 822-829. [iii] For data on child poverty rates by race and ethnicity see Alissa Anderson, A Better Measure of Poverty Shows How Widespread Economic Hardship Is in California (California Budget & Policy Center: October 2016), p. 2. For research on disparities by race and ethnicity, see Tamara Halle, et al., Disparities in Early Learning and Development: Lessons From the Early Childhood Longitudinal Study — Birth Cohort (ECLS-B) (The Council of Chief State School Officers and Child Trends: June 2009) and James J. Heckman, “Schools, Skills, and Synapses,” Economic Inquiry 46 (2008), pp. 289-324. [iv] Budget Center analysis of US Census Bureau, Current Population Survey data. Data limitations likely result in a conservative estimate of the number of children in California who are eligible for subsidized child care and development programs. 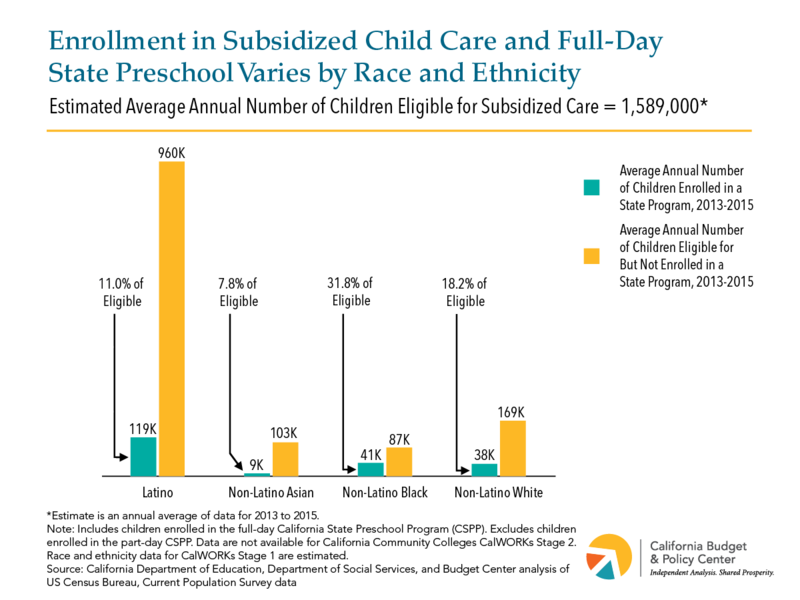 For more information about the methodology used to calculate this estimate, see the Technical Appendix from Kristin Schumacher, Over 1.2 Million California Children Eligible for Subsidized Child Care Did Not Receive Services From State Programs in 2015 (California Budget & Policy Center: December 2016). [v] The 210,000 figure reflects children enrolled in the full-day California State Preschool Program (CSPP) or in one of the following subsidized child care programs: Alternative Payment Program; CalWORKs Stages One, Two, or Three; Family Child Care Home Network; General Child Care; and the Migrant Child Care and Development Program. Data are not available for California Community Colleges’ CalWORKs Stage 2. Enrollment is a three-year average for October 2013, October 2014, and October 2015. This analysis includes the full-day CSPP, which consists of part-day preschool and “wraparound” child care, because it accommodates many — although not all — families’ work schedules throughout the year, and thus approximates the experience that a child would have in a high-quality subsidized child care program. In contrast, this analysis excludes an average of roughly 94,000 children who were enrolled in the part-day CSPP, without access to wraparound child care, in October 2013, October 2014, and October 2015. This is because most families with low and moderate incomes likely need wraparound care in order to supplement the CSPP’s part-day, part-year schedule. This analysis reports enrollment data for a single month — as opposed to a monthly average for a calendar year or fiscal year — because the California Department of Education (CDE) does not typically separate part-day and full-day CSPP enrollment when reporting monthly averages. The CDE also states, “Caution should be used when interpreting monthly averages as some programs do not operate at full capacity throughout the entire year (e.g., State Preschool) while other programs have seasonal fluctuations in enrollment (e.g., Migrant Child Care).” Finally, the data are for October 2013, October 2014, and October 2015 because the CDE’s point-in-time reports are only available for the month of October. [vi] Racial and ethnic groups included in this analysis are Latino, non-Latino Asian, non-Latino black, and non-Latino white. Native American children, Pacific Islander children, or children identified as more than one race were not included due to small sample sizes. [vii] US Census Bureau, Current Population Survey, 2013-2015 3-Year Estimates. On average, from 2013 to 2015, Latino children made up 51.5 percent of the child population from birth through age 12. [viii] Other reasons why enrollment in subsidized child care and development programs could vary by race and ethnicity include: 1) parents’ preferences regarding care for their children and 2) having an immigration status that precludes enrollment in these programs. First, with respect to parents’ child care preferences, existing research has produced mixed results. Some studies show that child care preferences vary by the race and ethnicity of the parents, while other research suggests that child care preferences are not related to race and ethnicity. See Nicole Forry, et al., Child Care Decision-Making Literature Review (Office of Planning, Research and Evaluation, US Department of Health and Human Services: December 2013), p.18. With that said, newly published research using more recent data demonstrates that, among low-income families, Latinos’ perceptions regarding child care settings generally do not differ from those of white and black parents, nor are Latino families more likely to have family members nearby to care for their children while at work or in school. (Cited research did not explore data for the Asian population.) Researchers hypothesize that Latinos’ underutilization of formal child care arrangements, such as center-based care, may be due to specific barriers such as access to certain child care providers or language barriers. See Danielle Crosby, et al., Hispanic Children’s Participation in Early Care and Education: Type of Care by Household Nativity Status, Race/Ethnicity, and Child Age (National Research Center on Hispanic Children & Families: November 2016); and Lina Guzman, et al., Hispanic Children’s Participation in Early Care and Education: Parents’ Perceptions of Care Arrangements, and Relatives’ Availability to Provide Care (National Research Center on Hispanic Children & Families: November 2016). Second, with respect to immigration status, Budget Center estimates take this eligibility-related factor into account. Certain demographic groups’ underutilization of subsidized care is not related to children’s or parents’ eligibility based on their immigration status. [ix] Christina Walker and Stephanie Schmit, A Closer Look at Latino Access to Child Care Subsidies (Center for Law and Social Policy: December 2016), p. 4. [xi] Erica Greenberg, Gina Adams, and Molly Michie, Barriers to Preschool Participation for Low-Income Children of Immigrants in Silicon Valley: Part II (Urban Institute: January 2016) and Lynn A. Karoly and Gabriella C. Gonzalez, “Early Care and Education for Children in Immigrant Families,” The Future of Children 21(1) (2011), pp. 71-101. [xii] Of the number of low-income children in California with at least one immigrant parent, 82.6 percent are Latino and 9.4 percent are Asian. Low-income children with parents with limited English proficiency are also overwhelmingly Latino (87.4 percent). The next largest share are Asian children (8.2 percent). Budget Center analysis of US Census Bureau, American Community Survey, 2011-2015 5-Year Estimates. “Low-income” is defined as less than 200 percent of the federal poverty line. English proficiency is self-reported in the American Community Survey. [xiii] See Julia Gelatt, Gina Adams, and Sandra Huerta, Supporting Immigrant Families’ Access to Prekindergarten (Urban Institute: March 2014); Erica Greenberg, Gina Adams, and Molly Michie, Barriers to Preschool Participation for Low-Income Children of Immigrants in Silicon Valley: Part II (Urban Institute: January 2016); Lynn A. Karoly and Gabriella C. Gonzalez, “Early Care and Education for Children in Immigrant Families,” The Future of Children 21(1) (2011), pp. 71-101; and Christina Walker and Stephanie Schmit, A Closer Look at Latino Access to Child Care Subsidies (Center for Law and Social Policy: December 2016). [xiv] Liz Watson, Lauren Frohlich, and Elizabeth Johnston, Collateral Damage: Scheduling Challenges for Workers in Low-Wage Jobs and Their Consequences (National Women’s Law Center: April 2014). [xv] Data are for the female civilian population age 16 and over. Racial and ethnic groups are mutually exclusive. Asian, black, and white exclude people who also identify as Latina. Low-wage occupations are defined as those that have a median hourly wage that is less than two-thirds of the overall median hourly wage. In California, this includes food preparation and serving; building and grounds cleaning and maintenance; personal care and service; and farming, fishing and forestry occupations. Budget Center analysis of California Employment Development Department, Occupational Employment & Wage Data, 2015 and US Census Bureau, American Community Survey, 2015 One-Year Estimates. [xvi] Erica Greenberg, Gina Adams, and Molly Michie, Barriers to Preschool Participation for Low-Income Children of Immigrants in Silicon Valley: Part II (Urban Institute: January 2016) and Christina Walker and Stephanie Schmit, A Closer Look at Latino Access to Child Care Subsidies (Center for Law and Social Policy: December 2016). [xvii] Gina Adams and Jessica Compton, Client-Friendly Strategies: What Can CCDF Learn From Research on Other Systems? (Urban Institute and Office of Planning, Research and Evaluation, Administration for Children and Families: December 2011); Gina Adams and Monica Rohacek, Child Care Instability: Definitions, Context, and Policy Implications (Urban Institute: October 2010); and Danielle Ewen and Hannah Matthews, Adopting 12-Month Subsidy Eligibility (Center for Law and Social Policy: October 2010). [xviii] Nicole D. Forry and Sandra L. Hofferth, “Maintaining Work: The Influence of Child Care Subsidies on Child Care-Related Work Disruptions,” Journal of Family Issues 32 (2011), pp. 346-368; Yoonsook Ha, “Stability of Child-Care Subsidy Use and Earnings of Low-Income Families,” Social Service Review 83 (2009), pp. 495-523; Hannah Matthews, et al., Implementing the Child Care and Development Block Grant Reauthorization: A Guide for States (Center for Law and Social Policy and National Women’s Law Center: 2015), pp.35-37; and Judith Reidt-Parker and Mary Jane Chainski, The Importance of Continuity of Care: Policies and Practices in Early Childhood Systems and Programs (The Ounce: November 2015). [xix] Senate Bill 3 (Leno, Chapter 4 of 2016) gradually raises the state minimum wage to $15 per hour by 2023, or potentially later depending on the condition of the economy and the state budget. After the state minimum wage reaches $15 per hour, it will be indexed annually for inflation. For an in-depth discussion of the minimum-wage increase, see Alissa Anderson and Chris Hoene, California’s $15 Minimum Wage: What We Know and Don’t Know (California Budget & Policy Center: April 13, 2016).